In addition to providing mental health services, we believe in equipping, training and supporting other mental health practitioners, especially those who work in the field of deafness. We believe that supervision and consultation is one way we can do this. Play therapy supervision: Alexis is a Registered Play Therapist and Supervisor, certified by the Association for Play Therapy since 2004. She provides play therapy supervision to mental health professionals who are seeking guidance, advice or support in the work they are doing with child clients. 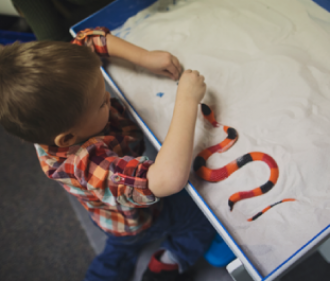 Some clinicians are working towards their credentialing as a Registered Play Therapist and want to have specific cases under the supervision of a Registered Play Therapist Supervisor. Other clinicians have great expertise working with adults and may want to venture into the field of child and adolescent mental health and play therapy. Alexis is able to provide supervision in a number of venues – whether local or long-distance, in an individual or group setting. Play therapy supervision/consultation and deafness: Alexis has been working in the field of play therapy and deafness since 1998. She has attended more than 150 hours of play therapy training, all geared towards working with hearing children. As many therapists who work with deaf children know, there can be a great deal of “tweaking” and adapting of interventions to working with deaf children. Alexis is eager to share these adaptations and their applications in the supervision setting. Long distance supervision and consultation can be provided using a variety of technologies. Social work supervision: Sara is a licensing supervisor documented with the Minnesota Board of Social Work. Sara is able to provide supervision for social workers at the LSW or LGSW level. Sara is also able to provide supervision to clinicians newly trained in Trauma Focused – Cognitive Behavioral Therapy. Hope and Healing Family Counseling, LLC accepts cash payments, checks, debit cards, and major credit cards. Fee for supervision services are due at the start of each session.